Hailing from the Madagascar Islands is the massive and Jurassic, Bismarck Palm Tree. A palm tree that will grasp your attention at a moment’s sight. The Bismarck palm will gain your respect as it gracefully lines many grand hotels and many sub-developments in the Southern United States and abroad. Widely used for xeri-scaping in Southern California to Arizona all the down to Florida, the Bismarck will make a great impression and addition to any home. The Bismarck, when fully matured, can be a beautiful focal point in your landscape or garden. The Bismarck Palm Tree also does well indoors, but due to its massive size, it usually finds its ultimate home outdoors. 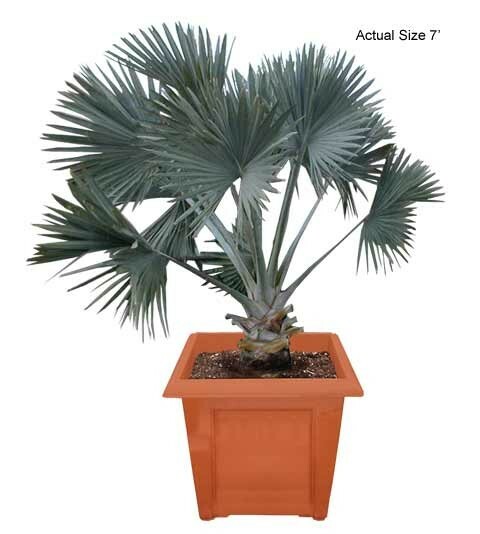 The Bismarck Palm Tree can grow to the maximum average height of about 60 ft but only with plenty of time as they are known to be slow-growers and are considered cold hardy to about 20 degrees F.
Each Bismarck Palm has noticeable differences, from its small spots found on its stems to the different shades of green, silver, and blue. The silver-blue fronds can add a dramatic appearance to any pool area, lawn, or tropical oasis. The Bismarck palm tree is one of the most sought after outdoor palm for its beauty an awe striking appearance and stately nature. This palm is a monotypic palm genus, meaning there is only one of this species, originally native to the large island and country of Madagascar, off the coast of Australia! Soon after colonizing on the island, the settlers and explorers were amazed by the majesty and beauty of the Bismarck Palm. Soon after, the Bismarck Palm began being cultivated throughout the world and it’s with great appreciation that we are able to add this stately palm to our Palmhugger’s Collection! These incredible plants are big, bold, and do best in full sun. This means you’ll need to leave it in full exposure to get the stateliest of all palm trees. During times of drought or winter freeze, the Bismarck Palm often slow it’s growth to an almost dormant state, but as long as they continue getting enough sunlight, nutrition, and some tender loving care, they are known to recover beautifully as grow much more robust each year. An interesting fact is that the Bismarck Palm was named after German chancellor, Otto von Bismarck who lived from 1815 to 1898. Very few botanists have used politicians for naming inspiration, but this is one grand exception, as Otto von Bismarck, was known for his stately and nature! So on your next exotic trip to Madagascar, don’t worry about bringing a Bismark Palm home on the plane, as these majestic palms can be shipped properly throughout the world directly to your home , office, or next project site! So whether you're next palm paradise project is located in your backyard or just want to make the neighbor’s a little jealous, the Bismarck Palm Tree’s reputation and appearance is enough to make anyone a true Palmhugger believer! Let's make the world a little greener with beautiful plants and exotic palm trees! Need some more info for your personal Palm Paradise, join our Palmhugger Community Forum above, and click on Palm Help! It's as easy as that! Your next question could help thousands of fellow Palmhugger's like yourself! 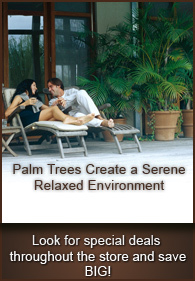 Medium palm trees range from 5 to 8 feet and are measured from soil to top of fronds. You can select your exact size on the drop down menu, labeled Palm Tree Size.